I spent the better part of yesterday afternoon becoming one with the universe, Legos, and a hot glue gun. The result is a diffuser set that stays together, but I can easily take it apart and swap out some of the diffusion material. Currently using the Canon supplied diffuser, two layers of 1/4 stop white silk, and a Gary Fong Puffer Plus. Also in the diffuser that I took apart to show you the guts there is a layer of 1/8 CTO gel. The diffuser that Canon supplies with the flash is made of some really opaque plastic, and it's solid. The clips on the diffuser, and the larger/deeper indent on the flash heads, lock the diffuser in place really well and can support some weight. 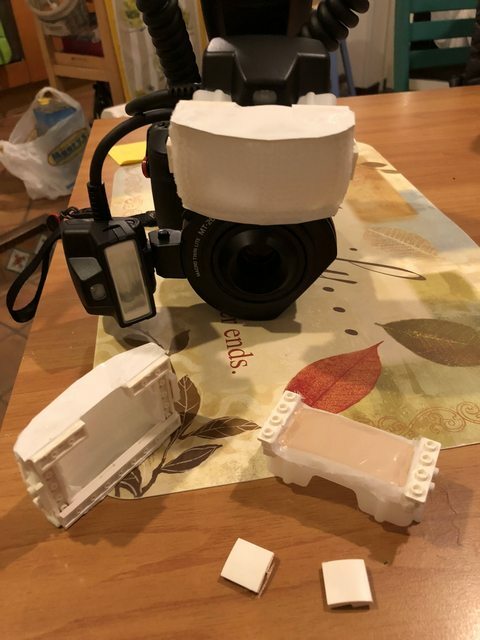 No need to hot glue the diffuser onto the flash heads like I had to do with the MT-24EX. A few years ago I was watching a tutorial on Youtube and in it a portrait photographer was using layers of white silk until he got the diffusion that he wanted. I really like the effect, but the amount of space that I have to work with is pretty limited so I'm restricted to just two or three layers. There has to be a gap between the layers or the amount of light reduced by the silk seems to go up exponentially. Done right the light from the flash becomes "feathered" and looks really soft. I use the Puffer Plus as a last stage for a couple of reasons. The outside surface is dimpled, so it has a lot more surface area than a flat piece of diffusion material. I can also use a larger section of it because it's curved. I use the heads in a key and fill arrangement, just like portrait lighting. So I need to be able to position the flash heads as close to 45 degrees apart as possible (key at the top with the fill off to one side). 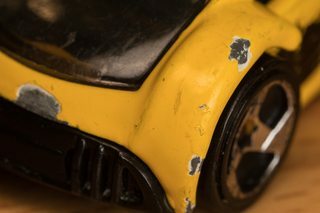 The 1/8 CTO gel is to make the light from the fill a little warm -really makes the subject "pop". Nearly all of the inspiration for my lighting comes from portrait photographers. 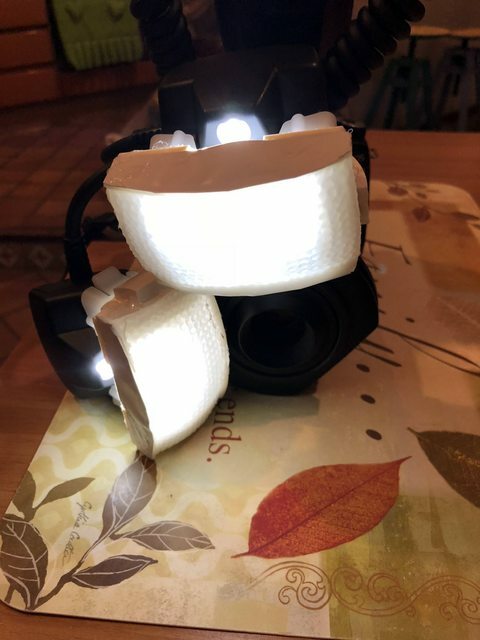 Here's a shot of both diffusers on the flash heads with the focusing lamps on. The brightness of the focusing lamps can be controlled in five increments, and this is with them set to level 4. 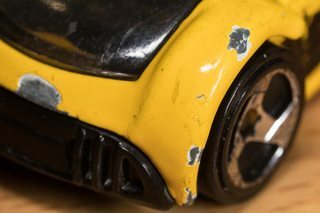 When my son was younger he gave me one of his Hot Wheels cars to use as a test target and I like using it due to the curved surfaces, windshield, and the gloss finish on the paint (although it has seen better days). Both images where taken with the Canon MP-E 65mm at 1x, so they represent the worse case in terms of light quality for me, since the diffusion only gets better as the distance between the subject and the diffusers gets shorter. Both images were shot in RAW with only minor changes in the RAW editor, and then converted to JPG.